equality of opportunity between women and men. 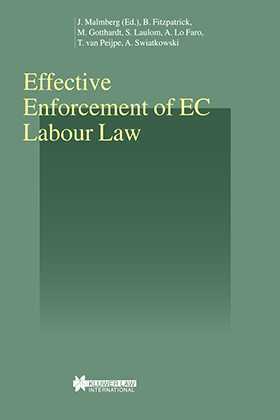 The principle of effective enforcement is analysed in the light of how labour law directives are enforced in France, Germany, Italy, the Netherlands, Sweden and the UK. The book also includes an analysis of regulations in Poland, which illustrates some of the challenges that candidate countries will face in joining the EU. Effective Enforcement of EC Labour Law is the result of collaboration between a group of labour law researchers from a number of European countries. The work has been co-ordinated by Jonas Malmberg, Associate Professor at the National Institute for Working Life, Stockholm, and Uppsala University.